HASTINGS, SR. Mr. Kenneth Earl Hastings, Sr. - a native of Foley, AL and a resident of Wilmer, AL died Saturday, July 24, 2010 at his residence. He was preceded in death by his parents Vernon Earl Hastings, Sr. and Helen Scroggins; and one sister Patricia Bennett. He is survived by his wife Wanda Hastings; four children Kenneth Earl Hastings, Jr., Lisa Marie Hastings, Crystal Joyce Hastings, and Kimberly Ann Hastings; two brothers Donald Ray Hastings and Vernon Earl Hastings, Jr.; three sisters Rebecca Hughes, Olivia Linke and Sandra Turner; two grandchildren Andrew Clyde Robinson and Brandon Michael Robinson; nieces, nephews and other relatives. Visitation will be from 5 P.M. until 8 P.M. on Tuesday, July 27, 2010 at Radney Funeral Home, Saraland. Graveside services and interment will be held at 10 A.M. on Wednesday, July 28, 2010 in Serenity Memorial Gardens. Condolences may be offered at www.radneyfuneral home-saraland.com. Kenneth Merle Scroggins, 85, passed away at his home in Tulsa on July 22, 2010. He was born at Wildhorse, OK on March 14, 1925. He is survived by his wife of 60 years, Joyce (Hegwer), three daughters and their husbands Suzanne and Larry Rogers, Carol and Mack Haltom, Danilu and Perry Denson, eight grandchildren, three greatgrandchildren, nieces and nephews. Preceded in death by his parents, three brothers, two sisters, and infant daughter, Sharla Jeanne. Kenneth served in the U.S. Navy during World War II in the South Pacific. He graduated from the University of Tulsa in 1951 and began his career in electrical supply sales, and retired after owning his own business for over twenty years. He was an avid sports fan, and supported TU Football by never missing a home game since 1946. Visitation will be held Sunday, July 25, from 1:00-6:00 PM at Moore Memory Chapel, 1403 South Peoria. Funeral services will be at 10:00 AM, on Monday, July 26 at Southwood Baptist Church, 10110 East 41st Street, with burial and military rites to follow at Memorial Park. In lieu of flowers, family and friends may make a contribution to their favorite charity. Under the direction of Moore’s Memory Chapel 583-6148. This obituary was published in the Tulsa World on 7/25/2010. MIDLAND Tommy E. Parrish, "World's Greatest Papaw," 65, of Midland passed away Tuesday, July 20, 2010. Family will greet friends Thursday, July 22, 2010, from 6 p.m. to 8 p.m., at Nalley-Pickle & Welch Funeral Home in Midland. Memorial services will be held at 10 a.m., Friday, July 23, 2010, at Fairmont Park Church of Christ in Midland with Scott Sheppard officiating. He worked in the oil industry most of his life. He worked as a Consultant for Laredo Petroleum until his passing. Tommy's grandchildren were the most important things to him. He loved going fishing at Lake Amistad and enjoyed attending his grandchildren's sporting events; he was their biggest fan. Mr. Parrish was a member of Fairmont Park Church of Christ. Survivors include his wife, Billie of 45 years; two daughters, Shannon and husband Terry Minica, D'andra and husband Bo Watson, all of Midland; one sister, Imogene and husband Waymon Hughen; one brother, Gary and wife Cheryl Parrish of Midland; two grandsons; and seven granddaughters. His parents and his brother, Roy Don Parrish, preceded him in death. Arrangements are under the direction of Nalley-Pickle & Welch Funeral Home & Crematory of Midland. Online condolences can be made at: www.npwelch.com. Scroggins, James Thomas (14 Oct 1940 - 17 Jul 2010) . Scroggins, James Thomas (14 Oct 1940 - 17 Jul 2010)  [FS:] [FaG:55155840]. Husband of Scroggins, Mary R. 'Bobbie' Bussey (29 Oct 1943 - 12 Mar 2016)  [FaG:159365374]. Son of Scroggins, Tom ( - )  [FS:]. Son of Scroggins, Juanita ( - )  [FS:]. Marion-Richard D. Edwards, age 79, of Marion, passed away Friday, July 9, 2010 at Memorial Mission Hospital. A native of McDowell County, Mr. Edwards was born May 19, 1931 and was a son of the late Frank and Elizabeth Glenn Edwards. He was a member of Rocky Pass Free Will Baptist Church and he retired from the U.S. Air Force and Department of Corrections. He will be remembered by his family as a loving husband, father, grandfather and friend. Preceding Mr. Edwards in death were his two daughters, Sandra Kay Edwards and Gwendolyn Hope Scroggins, and a brother, Arthur Edwards. Saddened by the loss of Mr. Edwards are his wife of 59 years, Ruth Frisbee Edwards, of the home; Vicki Webb, daughter and husband Robert, Richard D. Edwards Jr., son and wife Terri, Elaine Harris, daughter and husband Rev. Robert Harris; Mattheau English, Michelle Schmidt, Stacy Buchanan, Jennifer Ford, Kayla Staie, Luke Edwards, and Noelle Harris, grandchildren; Courtney, Claire, Taylor, David, Gwen, Willow and Corry, great-grandchildren; J.C., Bruce, Howard and Wayne Edwards, brothers; and Lucille Byrd and Mary Hollifield, sisters. A funeral service was held Sunday, July 11, 2010 at 2 p.m. in Westmoreland Chapel with Revs. Milton Hollifield and Robert Harris officiating. The family received friends from 1 to 2 p.m., prior to the service, at the funeral home. Interment was in Rocky Pass Free Will Baptist Church Cemetery. Full military honors were provided by the U.S. Air Force. In lieu of flowers, memorials should be made to Harriett Memorial Free Will Baptist Church, 1938 Highway 221-A, Forest City, NC 28043. An online register is available under OBITUARIES at www.westmorelandfuneralhome.com. WILLIAMSTOWN - Marie Scroggins Lawrence, 87, died Fri. Funeral 3pm Sun, Elliston-Stanley. Visit 12pm Sun. Scroggins, Violet M. Sharp (14 Aug 1937 - 7 Jul 2010) . Wife of Scroggins, Rev. A. D. (5 Mar 1932 - 24 Nov 2001)  [FS:]. 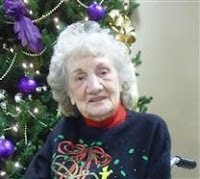 Margaret Dean Scroggins, 82, of Springfield, Mo., passed away Monday, July 5, 2010. Margaret was born in Greene County, Mo., and lived her entire life in Missouri. She was wed to James Scroggins  on October 10, 1945 after graduating from High School in Springfield. Margaret was very talented as an artist and seamstress. She was a giver and caretaker of her family without end, very industrious and active. Margaret along with her family lived in Springfield, Richland, and Lebanon, Missouri. She loved Jesus and lived her life as a reflection of that love. We are thrilled that she now has a new body and is in the best of health for all eternity. We'll see you soon Mom. Margaret was a member of First Baptist Church of Springfield. She was preceded in death by her parents, Joe and Margaret Erva Hindman; a sister, Marjorie Cook; and a son, David Kay Scroggins. Margaret is survived by her husband, James Scroggins; three sons, Terry Scroggins , wife, RaDonna, Springfield, Mo. ; Dennis Scroggins , wife, Sondra, Ashland, Mo. ; and Randy Scroggins , wife, Jeana, Ash Grove, Mo. ; a sister, Joann Puyear, Phoenix, Ariz.; eight grandchildren, Jennifer , Tara , Matthew  and Amanda Scroggins , Ryan Truster , Andrea Hagler , Summer McGinnis, and Austin Houp; and five great-grandchildren, Isaiah, Elijah and Aaron Hagler, and Logan and Charlotte Truster. Visitation will be 6 p.m. to 7:30 p.m. Friday, July 9, 2010, in Gorman-Scharpf Funeral Home. Funeral services will follow at 7:30 p.m. Friday in the funeral home with Reverend Michael W. Overton, officiating. Schwermin, Richard F. (28 Dec 1954 - 3 Jul 2010) [328:L]. Schwermin, Richard F. (28 Dec 1954 - 3 Jul 2010) [328:L] [FS:L2ND-Z3R]. Husband of Scroggins, Jane Ann (Schwermin) (16 Oct 1956 - ) [145:L]. Chicago Sun-Times, Richard F. Schwermin, 6 Jul 2010 [GenealogyBank] [25 Feb 2016].